I looked it up. I shouldn’t have. I mean, can you blame me? What does “jet trash” mean? Sure, I could have waited a bit to let the film tell me, but I’m impatient. Turns out, the only definition the ol’ internet wants to give me is a derogatory term for a loose stewardess. Thanks, Internet, never change. 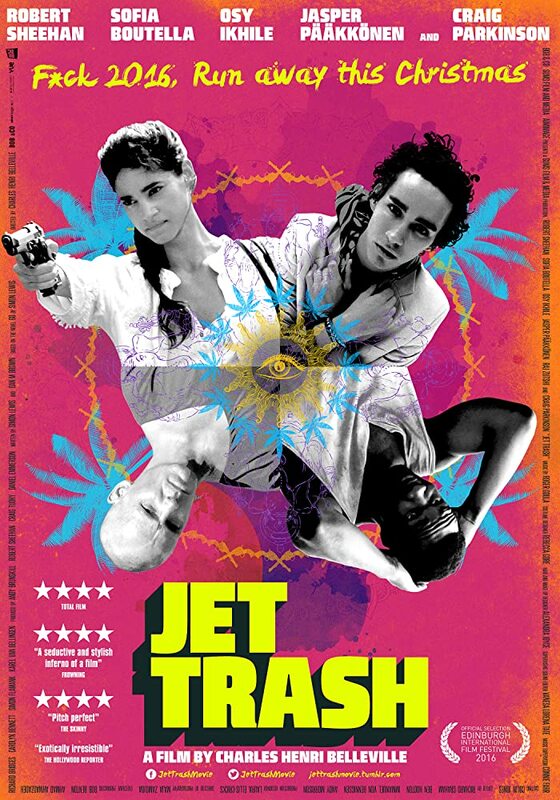 As much as that definition has no bearing on the film Jet Trash, you definitely get the feeling you’ve been through a raucous night with some jet trash once the film is done with you. The story at hand follows Lee and Sol as they’re cooling their heels in Goa, India, after running afoul of an underworld type back home in the UK. They’re seemingly content here, palling around with the spiritual-yet-unhinged Mike and frolicking along in a hedonistic Indian nightlife. But things go south for our boys when, in succession, a woman from back home shows up, the boys accidentally kill a cow (not a small matter in these parts, kids), and it looks as though their past is finally catching up to them. What propels the film the most is the acting from our leads: Robert Sheehan (remember him from Bad Samaritan?) brings an optimistically manic character to Lee, who can’t help but constantly bumble into trouble. Meanwhile, Osy Ikhile brings a quieter, more straight-man style to Sol, who just wants to right his own ship, even if that means leaving Lee out to dry. Sofia Boutella is allowed to actually do some acting here, and is pretty solid as the woman who has bewitched Lee and brings suspicion to Sol. And there’s just something entertaining about how purposefully uneven Jasper Pääkönen plays Mike, who’s constantly sliding from placidity to a miniature version of Hulk-style raging. On the other side of the fence, though, Craig Parkinson doesn’t bring all that much heat to the role of Marlowe, the man our boys have wronged, basically playing him as a dry, all-too-grounded and all-too-lacking-in-style-and-charisma version of Charles Dance in The Last Action Hero. On the other side of the camera, director Charles Belleville does mostly well, though the style, with the occasional dip into slow motion and the heavy presence of flashbacks, does come off as a bit of a knock-off Guy Ritchie type. Maja Zamojda’s cinematography is laden with highly saturated colors and interesting lighting schemes (particularly the lean toward bi lighting and nigh monochrome aesthetics in the flashbacks), giving the film a sense of neon noir when talking of criminal doings and something akin to Spring Breakers whilst cavorting with our boys. The shot of Marlowe going into the hot tub is my personal favorite. That said, the sickly yellow veneer that lays over the majority of the film left me thinking I was watching the action through a cheap pair of sunglasses I used to own, and this got a bit distracting at times. The script, adapted from co-writer Simon Lewis’s novel Go, is mostly fine, allowing us to sympathize with the highly problematic Lee and genuinely worry about how he and Sol are going to fare, and the parallels between the incident in the past and the killing of the cow allow the theme of the futility of running from troubles and responsibilities to seep into the brain. There are some pacing issues, though, as the plot dithers with the partying boys for far too long before actually getting going (just as I did here *wink*), and the motivations behind the various acts of duplicity are often rather hazy. In the end, you feel just as worn out as our boys, ’cause you’ve been through their hell with them. I’m not sure the film is gonna stay with me all that long, but it’s an interesting and entertaining experience regardless, a Ritchie-esque travail that eschews that director’s characteristic humor and absurdity in favor of a deeper immersion into bad decisions.